Ford Focus ST was first unveiled in the year 2005, bringing its looks and features to grab the competitive hatchback market. Ford with this unveil well-expressed its intentions to suppress the automotive makers and rule the market. 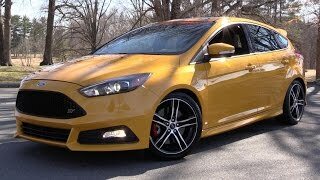 With every passing year model came with one or another upgrade and thus in this queue came Ford Focus ST 2015. 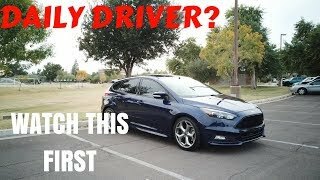 Let us not waste more time and have a closer look at the review of Ford Focus ST 2015. Interior of Ford Focus ST 2015 holds lot of similarity with its predecessor, however there are certain updates noticeable, especially on dashboard and center console. First too some in our notice was the new arrangement given to switches located below infotainment display followed by parking brake which now find its place alongside driver seat. The flat bottom steering wheel now comes with three-spokes unlike the previous which had four. For Ford Focus ST 2015 company has added some additional gauges for boost pressure, oil temperature and oil pressure above the center console. Seats are wrapped in gray and black fabric with an option to go with Tangerine Scream, Performance Blue, Smoke Storm and Race Red. Apart from these in technological advancements is new USB charging port which charges faster in comparison to one it replaced and section in front door featuring storage units with cup holders. Exterior of Ford Focus ST 2015 is attractive with its aggressive looks. Adding to its menacing features are all new long and narrow headlights sitting in front of the slightly bulged hood from the center. Company has removed the previously portrayed two bumper extensions and thus the revised grille sits amidst the LED headlamps adding to the cleaner look to the front fascia of Ford Focus ST 2015. Moving towards the rear fascia of Ford Focus ST you’ll notice bit smaller taillights when compared to headlamps and come designed in a unique pattern. The differences go ahead from bumper that comes with black insert and roof spoiler. Carrying this entire majestic beauty is the all new set of 18” Rado Gray wheels. 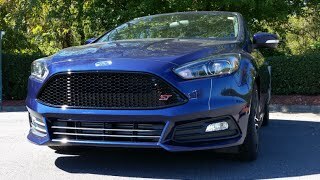 This is where things are unchanged as Ford Focus ST 2015 will be getting its power through same 2.0 Liter EcoBoost engine delivering same 252 hp and peak torque of 366 nm mated to six-speed manual transmission. 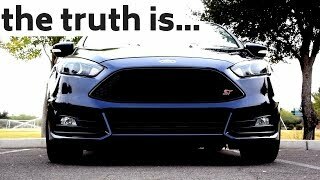 Thus Ford Focus ST 2015 can reach top speed of 154 mph while 0-60 mph sprint can be nailed in 5.9 seconds.